Metal-coated fibers are the type of optical fibers coated with a metal on the surface. Metal-coated fibers are preferred for harsh environments, high temperatures, and cryogenic applications. Optical fibers for use in high temperatures must be coated in order to protect the fibers from external environments to avoid damage. Polymers thermally degrade when the temperature crosses 3500C. Therefore, a metal coating is preferred for high-temperature applications. Copper is the most preferred coating material. Metals such as aluminum, nickel, gold, silver, and others are used for various applications. Metal-coated fibers fabricated by the ‘freezing’ technique are hermetically sealed. The method yields fiber strength that can be twice as high as that of polymer-coated fibers due to absence of water vapor during the process. Rise in demand for sensing cables or fiber optic sensors for measuring strain, composition, and other parameters at high temperatures in the oil & gas industry are driving demand for specialty optical fibers. Metal-coated fibers are preferred over polymer-coated fibers for sensing and EMI shielding applications at higher temperatures. . In April 2017, Fibercore launched a multimode (MM) and single-mode (SM) optical fiber used for continuous distributed temperature sensing (DTS) to provide constant thermal monitoring for turbines. In a majority of industrial applications, at high temperatures, metal coated fibers are associated with the problem of micro bending optical losses. This is owing to the high expansion modulus of the metal and high difference in thermal expansion coefficients of silica and metals. This is likely to restrain the expansion of the metal-coated fibers market in the near future. Demand for medical fiber optics is expected to rise significantly during the forecast period, which is anticipated to drive the metal-coated fibers market. Metal-coated fibers are used in the medical field for procedures involving endoscope placement, monitoring movement of tiny catheters, robotic surgery, vascular procedures and detection, bio-sensing, and precision biopsy. These procedures require high efficiency, accuracy, and precision-enabled invasive equipment. This is expected to provide lucrative opportunities to the metal-coated fibers market. In terms of material, the copper segment is highly attractive as copper offers resistance to high temperatures of up to 6000C for short duration and more than 4000C for long duration. Nickel- and copper-coated carbon fiber veils and mats are highly popular for their properties including EMI shielding and electrical conductivity. Based on application, the oil & gas segment held a major share in 2017. Its share is likely to increase by the end of the forecast period. This is due to rise in demand for metal-coated fibers used in distributed temperature sensors for downhole oil well monitoring. Need for hi-tech sensing devices in the medical, defense, and aerospace industries and rise in interest of major material research organizations in developing high-strength smart composites embedded with metal-coated fibers are likely to boost the global metal-coated fibers market. In terms of region, Asia Pacific dominated the metal-coated fibers market in 2017. Asia Pacific and Europe cumulatively accounted for more than 60% share of the global metal-coated fibers market in 2017. North America is a mature region of the metal-coated fibers market due to the presence of many manufacturers in the region. The oil & gas and defense & aerospace industries in Asia Pacific, Europe & North America regions are expanding rapidly due to shift in government focus toward sustainable development. Increasing focus on research and implementation of advanced composites for harsh environments without compromising on mechanical properties is contributing to the attractiveness of the metal-coated fibers market in Asia Pacific. The metal-coated fibers market in North America, Europe, and Asia Pacific is expected to expand at a fast pace, while that in Latin America and Middle East & Africa is projected to expand at a moderate pace during the forecast period. Key players operating in the global metal-coated fibers market are Fiberguide Industries, Inc., IVG Fiber Ltd, Oz Optics Limited, Art Photonics GmbH, Conductive Composites Co. LLC, Technical Fiber Products Limited, Engineered Fibers Technology, LLC., LEONI, etc. Key players are expected to invest significantly in research and development of innovative products to carve a niche for themselves and gain significant share in the market. Developing new coating technologies with less deformities is the major concern for many manufacturers. Key players continues to develop patented technologies in the field of optical fibers in order to meet expectations and requirements of OEM customers. Moreover, companies are adopting aggressive marketing tactics and merger & acquisition strategies to expand their market share by developing relations with new customers and extending existing relationships. They are also shifting their production facilities to emerging economies such as China and India and are expanding manufacturing capacity to improve operational efficiency in Asia Pacific. A metal-coated fiber is a fiber with a metal coating over it. Metals used for coating include aluminum, copper, nickel, silver, and gold. The metal coating layer provides high mechanical strength and improves electric and thermal conductivity. It also eliminates outgassing and increases the temperature range of the fiber. Metal-coated Fibers can be used for various applications, wherein protection from electromagnetic interference, radio frequency interference, and electrostatic discharge is required. A variety of metals with melting points of 1400°C or less have been developed as coating materials to endow fibers with unique properties. The most frequently used coating materials are aluminum, copper, nickel, silver, gold, and others. In terms of material, copper is the dominant segment of the Metal-coated Fibers market. Copper-coated fibers are known for better EMI shielding and electric conductivity at higher temperatures. Metal-coated Fibers embedded optical sensors are used for distributed temperature sensing (DTS) for down-hole oil and gas operations. Metal-coated Fibers can be sterilized using ETO, steam, e-beam, or g-radiation when employed in medical applications such as laser ablation of the prostate, to shrink enlarged prostate glands, and photodynamic therapy destruction of tumors. Metal-coated Fibers are used in high-temperature alarm systems to ensure they remain functional in Emergency conditions e.g. in case of fire. Need for hi-tech sensing devices in the medical, defense, and aerospace industries and rise in interest by major material research organizations for developing high-strength smart composites embedded with Metal-coated Fibers are likely to boost the global Metal-coated Fibers market. However, degradation of metal-coated optical long fibers in harsh environments such as high temperatures is one of the key factors expected to hamper the Metal-coated Fibers market during the forecast period. In terms of material, the copper segment held a major market share, followed by nickel and aluminum. This is because cooper offers high resistance to temperature and high conductivity and shielding capabilities. In terms of fiber, multimode fibers is projected to be a highly attractive segment of the global Metal-coated Fibers market during the forecast period. In terms of coating method, freezing is the basic method followed by many manufacturers. In terms of end-use, the oil & gas accounted for a major share of the global Metal-coated Fibers market in 2017. Asia Pacific held significant share of the market in 2017 in terms of value. The oil & gas, power generation, nuclear reactors, health care, and defense & aerospace sectors are expanding at a significant rate in the region. This is anticipated to offer lucrative opportunities for the Metal-coated Fibers market in Asia Pacific. The region is expected to continue its dominance throughout the forecast period. The market in Europe and North America is likely to expand at a significant pace in the near future. This report analyzes and forecasts the market for Metal-coated Fibers at the global and regional level. The market has been forecast based on revenue (US$ Mn) from 2017 to 2026, considering 2017 as the base year. The study includes drivers and restraints of the global Metal-coated Fibers market. It also covers impact of these drivers and restraints on demand for Metal-coated Fibers during the forecast period and also contains current Metal-coated Fibers market indicators. The report also highlights opportunities in the Metal-coated Fibers market at the global and regional level. The report reviews the technical aspects of different coating materials being coated on fibers and their potential applications. It also covers the processing methodologies with schematic diagrams. Since the market is in its R&D stage, the report also covers the intellectual property around the domain. The report includes detailed value chain analysis, which provides a comprehensive view of the global Metal-coated Fibers market. Porter’s Five Forces model for the Metal-coated Fibers market has also been included to help understand the competitive landscape. The study encompasses market attractiveness analysis, wherein material, fiber, coating method, and end-use are benchmarked based on their market size, growth rate, and general attractiveness. The report also covers historic global Metal-coated Fibers market size (US$ Mn) for the period 2013 to 2016 based on material, fiber, coating method, end-use, and region to help understand the market. 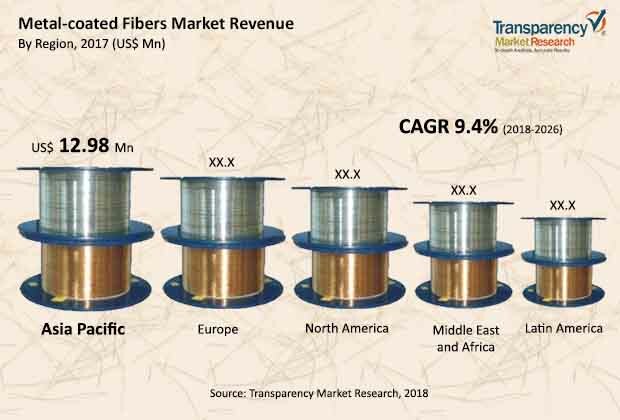 The study provides a decisive view of the global Metal-coated Fibers market by segmenting it in terms of material, fiber, coating method, and end-use. In terms of material, the Metal-coated Fibers market has been classified into the type of material being coated on fibers such as aluminum, copper, nickel, gold silver, and others. Based on fiber, the Metal-coated Fibers market has been segmented into single mode fibers, multimode fibers, and others. In terms of coating method, the Metal-coated Fibers market has been categorized into freezing method, electroplating, electroless plating, and others. Based on end-use, the Metal-coated Fibers market has been bifurcated into oil & gas, research & development, medical, defense & aerospace, telecommunication & data centers, and others. These segments have been analyzed based on present and future trends. Regional segmentation includes current and forecast demand for Metal-coated Fibers in North America, Europe, Asia Pacific, Latin America, and Middle East & Africa. The report provides the actual size of the Metal-coated Fibers market for 2017 and estimated market size for 2018, with forecast for the next eight years. The global Metal-coated Fibers market has been provided in terms of revenue in US$ Mn. Market size has been provided in terms of global, regional, and country level market. The report comprises profiles of major companies operating in the global Metal-coated Fibers market. Key players operating in the Metal-coated Fibers market include Fiberguide Industries, Inc., IVG Fiber Ltd, Oz Optics Limited, Art Photonics GmbH, Conductive Composites Co. LLC, Technical Fiber Products Limited, Engineered Fibers Technology, LLC., and LEONI. The report also includes competition matrix and product mapping of the above mentioned companies.